Summer fun with or without your dog! It appears that posts will be infrequent during the busy summer season here at the farm. We now have a tractor and a Plan. Fear us!! However, dogs are still number one here and we’re always coming up with new ways to make their visit with us the most fun they can have away from home and family! 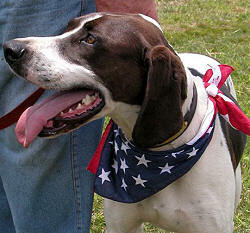 First five dogs who reserve space for July 4th weekend will go home wearing American flag bandanas. If you’re just hanging around the house this summer and your dog is bored, missing his playmates, Mickey at Waggin’ Tails Doggie Daycare is having some cool June promotions which you can check out at her website: www.waggintailstraining.com. Win some free daycare, a bath, or nail trim just buy giving your Best Friend some playtime with his or her buds. So, traveling the world or staying home, there’s always a good place for the furkids to hang. This is Juda. He’s our latest foster from Rocky Mt. Great Dane rescue and what a sweetheart he’s turned out to be. 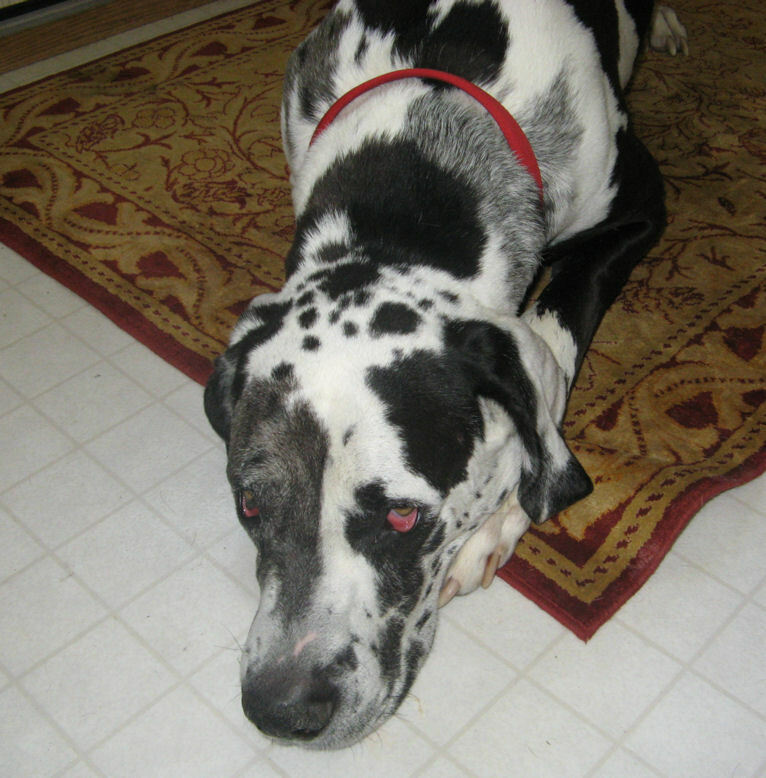 Poor Juda never learned to play with other dogs appropriately, but rather would run and jump on their backs, which you can imagine, escalated pretty quickly to fighting. We got Juda last Saturday, a week ago. Over the course of the week, we’ve introduced him to our pack slowly, on a lead, or loose in our yard, with our dogs outside on leads. We discovered pretty quickly that Juda is a reactionary dog. Dag and Vala are calm, laid back Danes and we were able to immediately let him hang around with them in the kennel or in our yard, with the other boys inside. They practically just all ignored each other. We knew he had some issues, but were pleasantly surprised to find out they didn’t seem to be that bad. Then we introduced him to Kleiner, by himself and all seemed well until they began running and looking like they’d play. Juda immediately jumped on Kleiner’s back and it sort of went downhill from there. But after a couple of corrections, the boy really seemed to figure out what we wanted. Within an hour, they were pretty much ignoring each other and when they did interact, it was all totally appropriate. Juda is still going to need some lessons, but the pack has been schooling him pretty regularly all weekend and I imagine his big doggie brain is overflowing with information to process. Thank goodness he’s such a smart boy. And quite the snuggle bunny.